Istana Bogor is one of 6 Presidential Palaces in Indonesia. The palace is noted for its distinctive architectural, historical, features, as well as the adjoining botanical gardens. Istana Bogor was opened to the public in 1968 to public tour groups (not individuals), with the permission of the then President of Indonesia, Suharto. 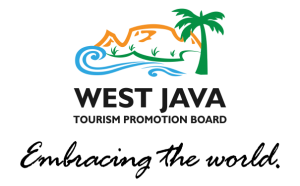 The number of visitors annually is approximately 10,000 people. The gardens of the palace have an area of 284,000 square metres (28.4 hectares). 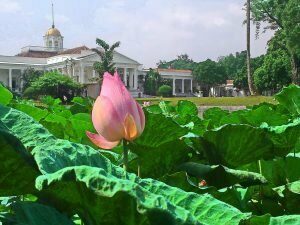 The original colonial building on the site of Istana Bogor was a mansion named Buitenzorg (also Sans Souci), which was built from August 1744 as a country retreat for the Dutch Governors, including also during the period of British administration. Notable occupants of the mansion include Herman Willem Daendels and Sir Stamford Raffles. This building was substantially damaged by an earthquake in 1834, triggered by the volcanic eruption of Mount Salak. The palace was rebuilt into its present form in 1856— this time with only one storey instead of the original three, as a precaution against further earthquakes. From 1870 to 1942 the Istana Bogor served as the official residence of the Dutch Governors General. After Indonesian independence, the palace was much used by President Sukarno, but then largely neglected by Suharto when he came to office. The grounds of the estate contain several buildings – The largest of which is the main palace and its two wings. The main palace contains private offices for the head of state, a library, a dining room, a ministers’ meeting room, a theater room, and the Garuda room (for welcoming State guests). The two wings are used as the guest residences for State guests. Kebun Raya Bogor (“Great Gardens of Bogor”, the Bogor Botanical Gardens) are also part of the palace grounds. The palace houses an extensive art collection which had been accumulated by Soekarno. 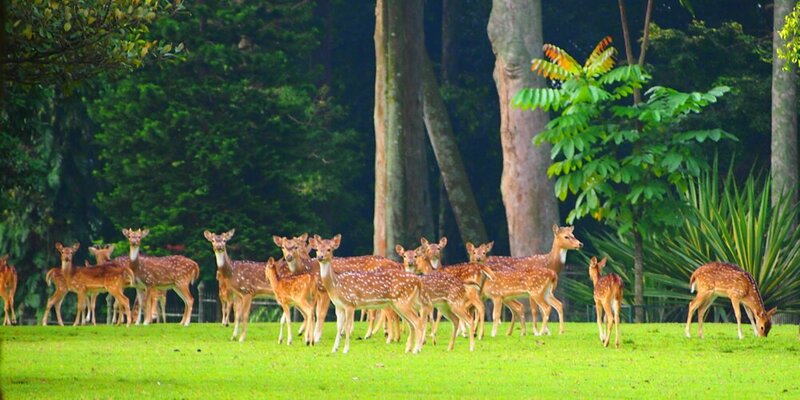 A herd of spotted deer still range within the palace grounds; a group of these had originally been brought there by the Dutch for hunting and sport.